Last year our main focus was targeting litter on our campus, we collected data and found that Apple & Eve juice boxes was the number one source of litter on our campus. 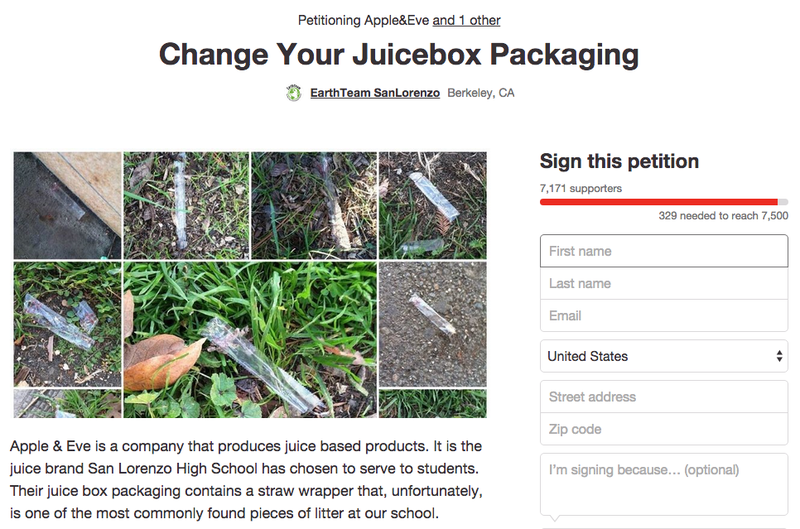 Then We made a petition asking Apple & Eve to change their packaging. We started the petition by brainstorming ideas to stop or change the littering on our campus. Throughout last year we worked our hardest to make a difference we achieved to get signatures from 6,859 throughout the world. Our school is not the only with the same problem. If we do something about our litter other schools will start doing the same. Some challenges we had, were getting students, community members, and school staff to care about the situation. We had to find the primary source of who liters the most out of the 4 class sections, and our conclusion was that the freshman and sophomores were the ones because they could not leave campus so they had to eat cafeteria food. Teaching them would not be easy. The goal of our petition was to get the juice boxes as far away from our district so they would never be seen again. This year we are finishing what we started. We need all the support so please contact Christina at christina@earthteam.net for more information.